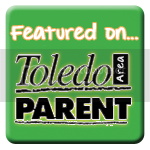 Initially, when I set out to run the Toledo 1/2 Marathon, my goal was to finish. Whether that meant running, walking, or crawling the 13.1 miles it didn’t matter. After a couple months of training injury free, I started to feel really strong. So strong in fact that I decided finishing wasn’t enough; I wanted to set a new PR (personal record). My confidence was shaken and I really didn’t think I would be able to keep a 9:16 pace, the speed I would need to beat my old time. I was prepared to accept “good enough.” There would be other races I told myself. My dad, who would be my running buddy for the day, shuffled through the crowd and situated us near the two hour half-marathon pacer (a 9:10 pace). Just before the gun went off I whispered over to him, “I’m not so sure about keeping up.” Even though we planned on running together, I didn’t want to hold him back. “Just give it a couple miles,” he said reassuringly. Just a couple miles I repeated to myself. You can run that fast for at least a couple miles. You are strong and… BANG. The gun went off pulling me back into the moment. The crowd of runners started shuffling forward, a buzzing swarm of nerves and excitement crossing the start line. As we crossed the six mile mark my dad held up his hand for a celebratory high five. A strong finish was looking more and more promising. I started to visualize myself crossing the finish line with a sub two-hour time, my arms shooting excitedly into the air, a look of both pride and relief splayed across my flushed face. I thought about all the reasons I was running, all of the things it meant to me beyond my physical capability of putting one foot in front of the other. It meant I am a strong, determined woman. I can set a goal and see it through. My dreams are limitless. It meant I am not defined solely by my role as mother and wife. Around mile 10 I was still on pace, but the fatigue was starting to set in. The steady rain that had fallen all morning soaked through my socks, and a large blister had formed on my heel. Thoughts of slowing down, of possibly not meeting my goal again crept up. As powerful as visualizing success can be, so too can visualizing failure. And visualize it I did. Caught in a mental game of tug-o-war, my confidence wavered with every exhalation. I passed the mile 11 marker; I CAN’T do this. I’m a failure. I passed the mile 12 marker; I CAN do this. I’m a success. I passed the 13 mile marker. I CAN’T. I CAN. I CAN’T. I CAN. THUD. My racing mind hit the proverbial wall, coming to a jolting realization. I am wasting so much of my energy and focus debating CAN or CAN’T that I’m overlooking the things I AM doing, right now in this very moment. Things that are true whether I cross the finish line or not. I am running. I am running strong. I am running determined. I am seeing a goal to its completion and in the process proving my dreams are limitless. 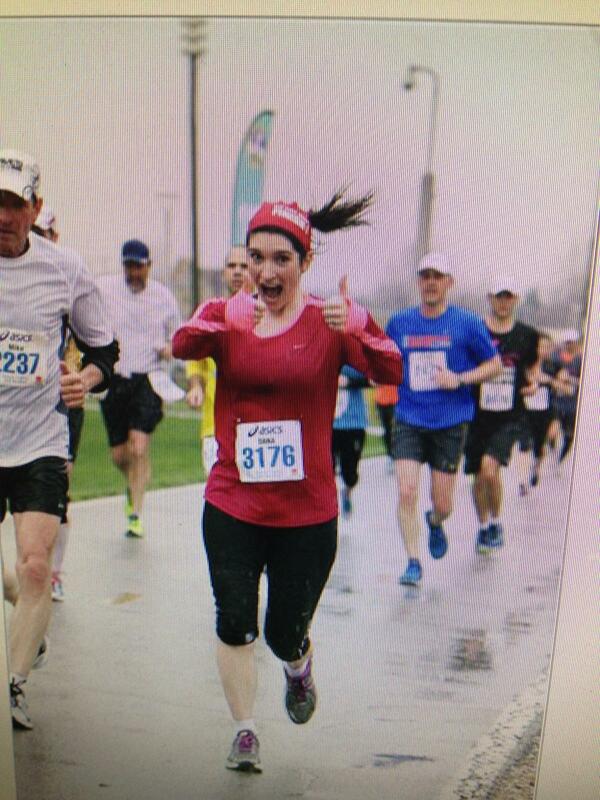 I am not solely a mom nor solely a wife; I am a runner. Does not finishing this race in an arbitrarily selected time take away from any of that? I don’t think so. So why am I putting so much significance into that one element? Why am I letting it define what constitutes a success? Why don’t I try creating a new measure of success? 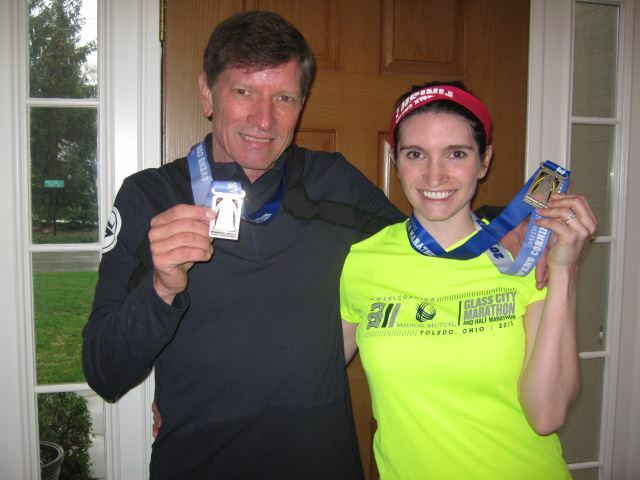 Like spending two hours running, side-by-side with my dad, who just a couple years ago thought running 13.1 miles was a crazy person’s undertaking. Or sharing in the pre-race jitters and excitement with a crowd of strangers who were all united by a singular love of running. Then there’s partaking in post-race celebrations with my entire family, enjoying an amazing brunch cooked by my mother-in-law. Why not let those moments define the day? When I crossed the finish line, the clock read 1:59:45. I was simultaneously exhausted and elated. I had done it. I met my time goal. It meant a lot to know I could do it, but what I came to realize over those 13.1 miles was that it didn’t mean everything. It’s important to set goals in life, but it’s equally important to realize that goals are not always the end-game. There is the journey you must take on the way to meet them. The lessons you learn when you fall short. The pride you feel when you reach them. And the peace afforded to you when you realize that you are defined by so much more.